It's officially my favorite time of the year, pumpkin season! I want pumpkin everything. 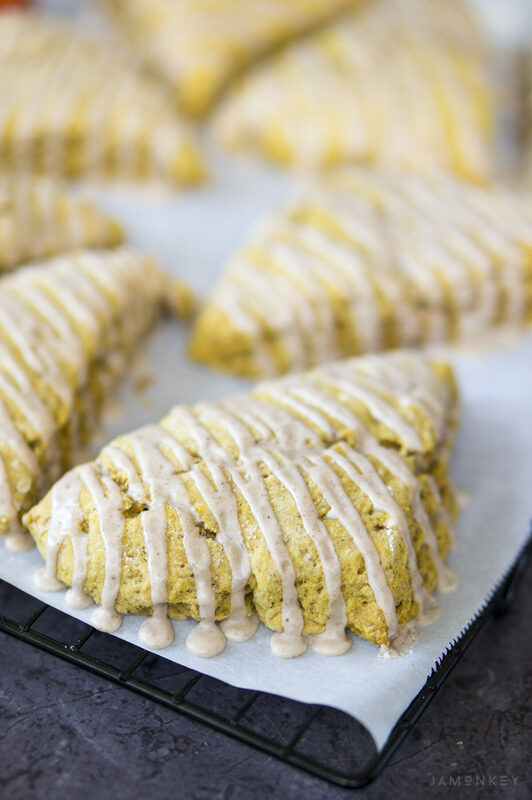 Pumpkin cookies, pumpkin cereal, pumpkin pie spiced coffee, and these delicious pumpkin scones as well. Give me all the pumpkin! I bought a case of pumpkin so that I can make all the pumpkin things this year. 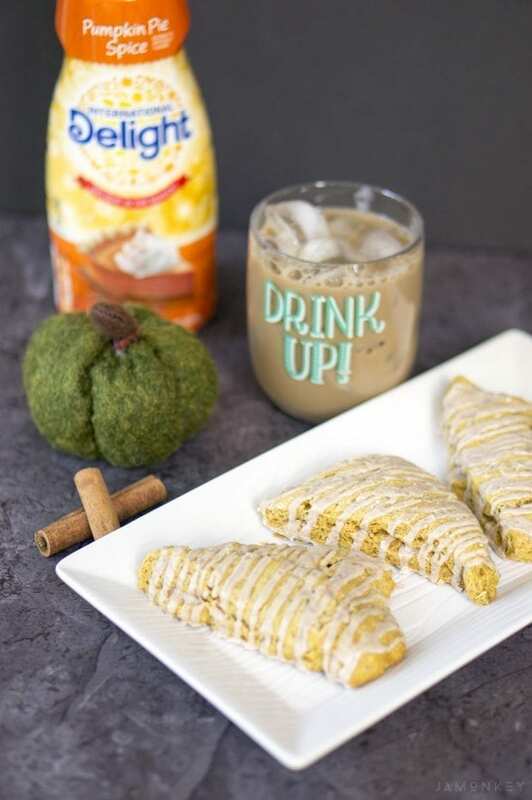 This recipe uses International Delight Pumpkin Pie Spiced Creamer to give it some added flavor. You'll find it in the scones and in the icing that I use on the top. This batch was gobbled up pretty fast, and they go perfectly with some Pumpkin Pie Spiced Iced Coffee. Mix the dry ingredients (flour, baking powder, baking soda, salt, cinnamon, cloves, nutmeg, ginger, and brown sugar) together in a bowl. Cut butter into 1/2 inch cubes and add to dry mix. Using a fork or a pastry knife, cut in the butter until it is the size of peas or even smaller. In a separate bowl whisk the pumpkin, egg, vanilla, and International Delight Pumpkin Pie Spiced Creamer together. Fold mixture into the dry mix with a spatula. Place the dough on a lightly dusted piece of parchment paper. Knead the dough into a ball and press into a disk. Cut the dough with a pizza cutter and place onto prepared baking sheet 2 inches apart. Bake for 10-12 minutes or until you can stick a toothpick in and it comes out clean. 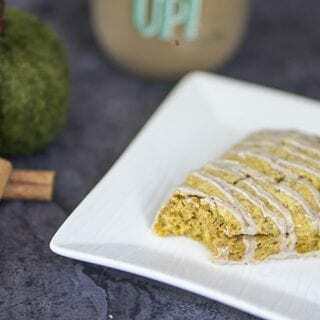 For the Pumpkin Spiced Icing just combine the sifted confectioner's sugar, nutmeg, cloves, cinnamon, ginger, and International Delight Pumpkin Pie Spiced Creamer together. I placed mine into a piping bag, but you could dip the tops or drizzle the icing with a fork. Just make sure the scones are cooled when you ice them; otherwise, they will have runny icing. Mine weren't completely cooled when I put the icing on, but I wanted mine to spread out over the scone. 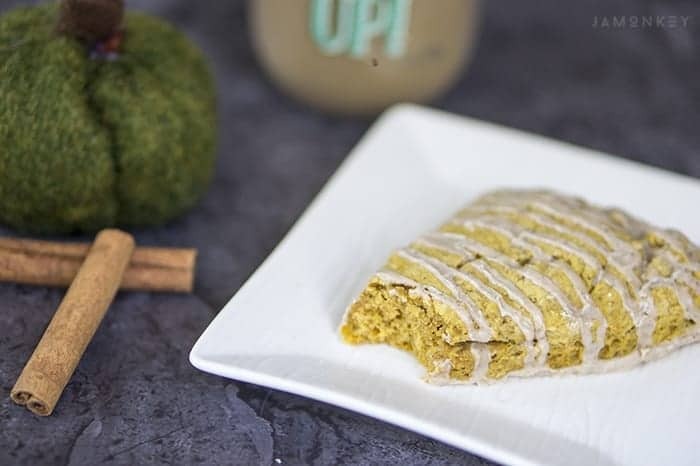 I enjoyed my Pumpkin Pie Spiced Scone with the new International Delight Pumpkin Pie Spiced Iced Coffee. I like being able just to pour and drink it. Mix flour, baking powder, baking soda, salt, cinnamon, nutmeg, cloves, ginger, and brown sugar in a bowl. 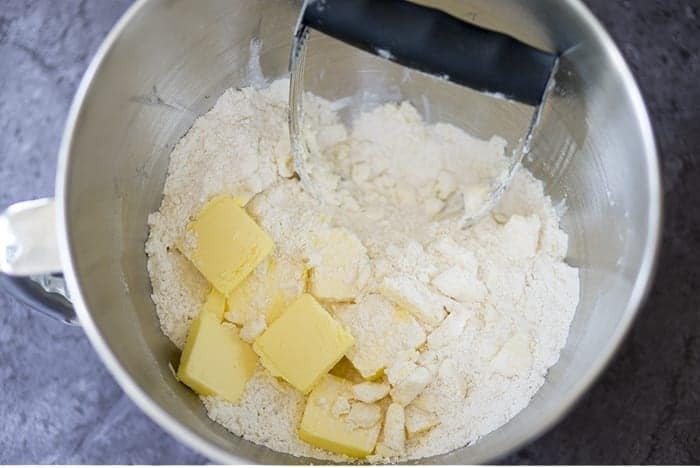 Cut cold butter into 1/2 inch cubes and place in dry mix. Using a pastry knife or a fork, cut butter into the dry mixture until it forms pea sized (or smaller) balls. In a separate bowl, whisk together pumpkin, egg, vanilla extract, and creamer. 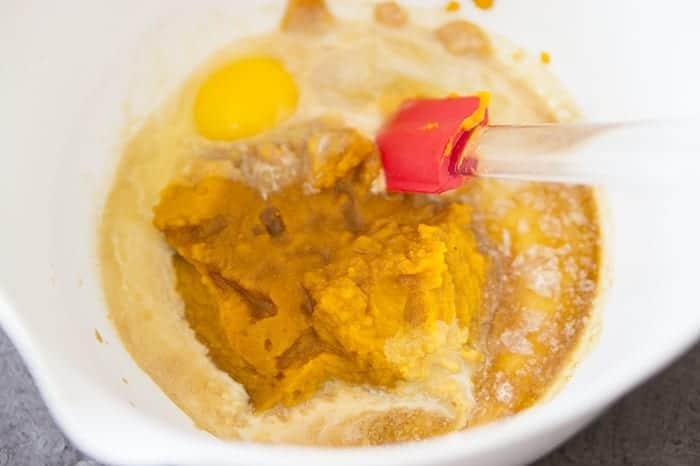 Fold the pumpkin mix into the dry mix with a spatula. On a lightly dusted piece of parchment paper, roll dough into a disk about 1-inch thick. Use a pizza cutter to cut into 8 pieces. Separate the pieces on your baking sheet about 2 inches apart. Bake for 10-12 minutes or until the toothpick is clean when you place it in the center. Allow the scones to cool for at least 10 minutes on a cooling rack before icing. Sift confectioner's sugar into a bowl. Add in and whisk together nutmeg, cloves, ginger, and cinnamon. 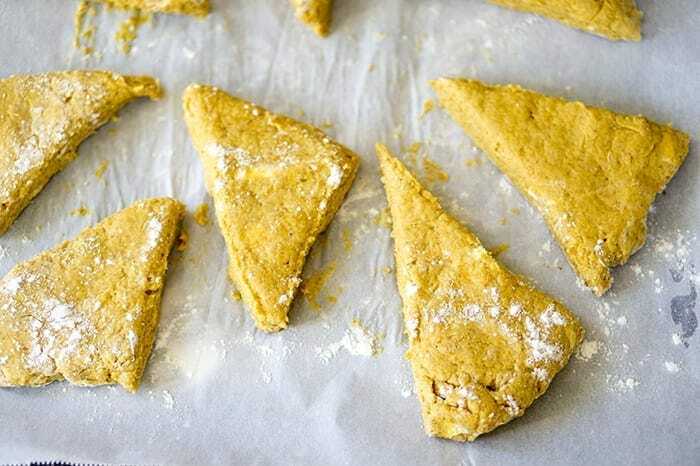 Drizzle or dip the tops of the scones and allow to dry. oh yummmmmmm. And these are just PERFECT for a fall tea time!